About a month after getting back from my ‘All Points North‘ ride around the Highlands and to Orkney I was ready to get back out for a solid day trip on the bike. I’d done a few commuting rides since but was itching for something a bit longer. It had turned out that riding across the North of Scotland with full kit clearly did some good as I’d got home and promptly smashed my best time up the hill that I live on the top of. I didn’t want to let that all go to waste so I took a Wednesday off work at the tail end of September and prepared for a day out. Living on the south coast has many advantages; choice of direction in which to set out for a ride is not one of them though. Most of my rides have ventured either west (across the Weald or along the South Coast past Brighton) or east towards, and into, Kent. Oddly, I had rarely ventured straight North. I was also aware of some adventurous river crossings I wanted to take; so it was that after a light breakfast I was on my way by eight thirty a.m. First up was probably the sharpest climb of the day, Elphinstone Road in Hastings. One of those nasty hills that starts off sharp and gets continuously steeper as it goes up. It’s not long but I wasn’t ready, was not warmed up, and I had to stop a few times on the way. Not a great start but I knew that, though not flat, I didn’t have anything as tough again until just before Maidstone. From on top of ‘The Ridge’ that marks the northern edge of Hastings I headed out of town on the small lane towards Westfield. This lane can be a bit of a rat run with cars heading down it at unnecessary speeds, but today it was fine. The other side of the village and across the main A28 I discovered that the next road to Sedlescombe had been recently resurfaced; This was another pretty country lane to another pretty country village. and I made the most of the fresh tarmac. The Sedlescombe Geese were already out and about doing their regular duties looking pretty on the village green as I rode past. Leaving Sedlescombe the road rises steadily for a couple of miles past Cripps Corner up to a high point in Staplecross village. The road to this point is relatively busy but nice and wide and open and I was still riding happily. At Staplecross the busier road bears east towards Rye but I carried on Northwards heading downhill into the picture perfect Rother Valley at Bodiam. There are few more bucolic English villages than Bodiam on a glorious summers day. Sitting in the beer garden of the Castle Inn eating good food and drinking good beer watching the birds flutter around the houses is relaxing enough. Add in a game of cricket in the field behind the beer garden. Now look behind you to the right and admire the lines of vines heading up the south facing slopes of the valley. Now over your left shoulder admire again the Castle that the pub is named for; one of the most famous Castles in the country. Then your attention is drawn back in front of you again; over the river to the other side of the valley. The source of the whistle that attracted your attention is clearly visible at the base of the cloud of steam left behind by the train coming into the Bodiam station terminus of the Kent and East Sussex Railway. Today however was a Wednesday at the tail end of September; autumn was well on its way and I was too early for a beer. Indeed I was too early for a visit to the Castle which was not due to open for half an hour but, despite some quizzical looks from the staff, nobody stopped me as I rode in anyway. I had a quick glance at the castle from besides the moat; making the most of a rare chance to admire it without other visitors, and then headed back on my way; I was still early on my day’s riding and needed to tick some more miles off. From Bodiam I put my head down and rode north again. 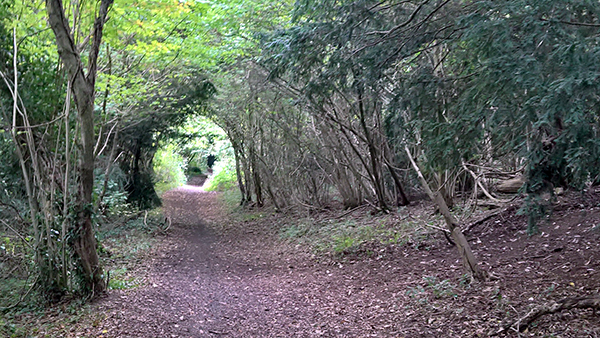 The riding was lovely across this part of the Weald but other than keeping an eye on my maps to keep me on my planned route I carried straight on without stopping. The ride South of Bodiam was all on roads that I know well (sadly mostly from driving) but I was now into less well chartered territory. I knew a lot of the villages in the next part of the countryside but was heading down lanes that I knew only vaguely, if at all. At Cranbrook, which was a convenient 20 miles into the ride, I took a very brief detour to park my bike and have a quick break at the Union Mill. I’ve not yet been ever able to visit inside the mill. I wasn’t expecting to do so today either but it was still a lovely place for a short break. From Cranbrook the Weald continues for only a few more miles. South of Staplehurst (which I skirted around the western side of) the Weald comes to an end with a view over the (mostly) flat and low lying lands which make up the next five miles before the sharp rise of the Greensand Ridge immediately South of Maidstone. Dropping off from the Weald I was amused and delighted to now spot one of the most lovely examples of a Wealden Hall at Rabbits Cross Farm – I was in full flow as I passed but I had to hit the brakes and turn back to admire it. 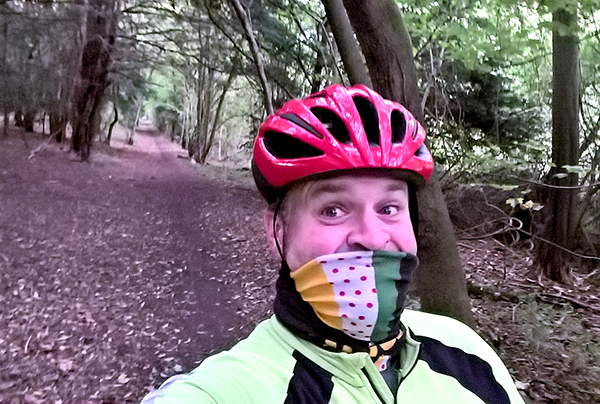 I made the most of the flatter miles in preparation for the climb up onto the Greensand Ridge. The hill was much as I expected. It was pretty damn tough and with a few false summits before eventually coming to the top of the hill at Chart Sutton. At the top of the ridge a left turn along the top for a short way gave me a chance to get my breath back before preparing to cross onto some back roads into the edge of Maidstone. I got a little lost trying to take some short cuts through the estates of the town and eventually had to double back and make my way onto the main road and drop the most direct way into the town centre. Maidstone gives some hints that there could be a lovely town hiding in there somewhere. There are some lovely medieval buildings to spot but they are sadly hidden amongst post war developments and the god awful road system makes getting to them nigh on impossible. As a result the town is extremely horrible to visit on a bike. I stopped briefly for a quick bite to eat and to put on my coat as the Gods of Maidstone had decided to compound the misery of the town with a nasty sharp shower. I then began to navigate my way out. I’ve tried this a few times before and have still to be successful in this endeavour. As is often the way in towns, the cycle path signs are intermittent and often appear only when the route is obvious; leaving just a big enough space between them when they might be at their most useful. As every interruption in the cycle route involved navigating my way around the dual carriageway ring road system I cannot say that I was having much fun. I did eventually locate the track I was after; a narrow shared cycle and foot path alongside the main road out of town to the North. Some more confusion had me checking and double checking my progress as I came past the junction with the M20, but I was soon back on another path next to the dual carriageway climbing out of the town towards the Pilgrim’s Way. This climb is almost twice the height of the earlier Geeensand Ridge, but much less steep and more drawn out. It might have actually been quite fun were it not for the roaring traffic on the main road right next to me. I kept my head down. Even on a short section where the cycle way follows a side road for a few hundred yards there was no relief; indeed this might have been worse as I was now directly sharing the road with some of the big lorries that were thundering around using this piece of road as somewhere to park up for a break. Looking back at the maps now to check my route I’m disappointed to see that I must have passed the Neolithic sites of Kits Coty and Little Kits Coty right by the road. I must have missed any signs as I was too occupied just keeping on up the hill and watching out for traffic. I shall have to come back to visit. I might use the car. At the top of Blue Bell Hill I could finally turn off away from the traffic. A building site at the road junction had curious signs insisting on no filming and photography should be undertaken. I would not have made any consideration of taking any pictures of a fenced off building plot had I not been told that it was prohibited; so I stopped to take a few pictures as obviously as possible before heading on my way along the ridge of the hill. The cycle path from here turns at ninety degrees from the main road and follows the ridge of the hill for a short while. A few yards along the ridge I turned into the small car park that allows visitors to enjoy a walk along the hill. The rain had stopped again now so I took my coat back off and stopped for a sandwich and to rest my legs whilst admiring the view back down over the Medway Valley. Even on a fairly cloudy day like this its quite a lovely view, so long as you squint and avoid looking at Maidstone. Leaving the car park I stopped to pay respects at the memorial to the crew of the Kent Air Ambulance that lost their lives when they crashed into the hillside here in 1998. Back on my way the cycle path follows the ridge only a short distance before turning into some woodland to follow forest tracks back down the hill in the vague direction of Rochester. In a few more weeks this track might have become a bit too wet and tricky to ride; indeed it might have already been too awkward to ride up on my bike; but downhill was OK. I enjoyed it, although I had to be a bit wary of some big protruding tree roots and some muddier sections. 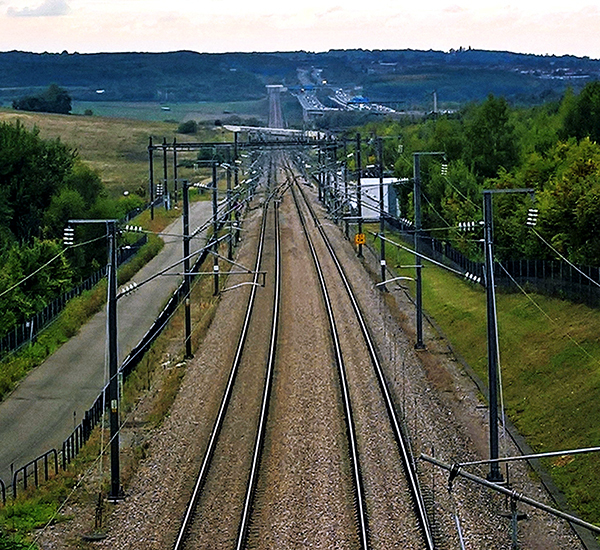 Before long I was at the bottom on a small track/access road alongside the channel tunnel rail link. A couple of easy miles followed heading towards the river at Borstal (home of the original young offenders institute) and then following the east bank of the Medway into Rochester. I was amused to learn of the existence of Rochester ‘Pier’ and so rode along to the end of it from which at least one can get a nice view back to the Castle and Cathedral. Then it was across the Medway to the west bank, past the Soviet submarine (yes you read that correctly), and up the short sharp hill past Frindsbury Church and the out of the town for a couple of quiet miles on country lanes before coming into the edge of Gravesend. You come into Gravesend alongside the Thames and Medway canal. On the opposite bank of the canal I could see the unmistakable signs of the Gravesend Water Sewage Treatment Works; the location of probably the most grim archaeological site I ever worked on. Many things from my days in archaeology will always stay with me. Sadly they include The Skip of Unpleasant Things™, the particular texture of the ground as the digger opened the trench, the discussions as to whether we should be placing toilet roll and condoms into a finds bag, and finishing off the last trench late into the evening by the light of the methane flame in order to avoid having to come back the next day. From the sewage farm, the route passes into Gravesend through a series of industrial estates that have the air of being the perfect location for a 21st century set Dickens film adaptation. Tightly packed warehouses with cobbled narrow alleys between them eventually give way to a canal basin marina that opens directly onto the Thames Estuary. From the marina I came onto the sea/river front. A group of artists were all out painting the now disused Tilbury Power Station on the opposite bank of the Thames. Later that week the chimneys were blown up removing another one of the area’s tall landmarks. Last time I rode along the North Kent Coast I did so just a few days before the even larger chimney at the Isle of Grain power station was destroyed; I seem to be a jinx for power stations along this stretch of coast. Although I had made it to the north Kent coast I was not done for the day. I had a river to cross but I still had about half an hour to spare so I took a (very) quick look at the 18/19 century New Tavern artillery fort and then dashed over to St Georges Church. Somewhere in the church yard is the last resting place of Pocahontas. Her short life came to an inglorious end when she died after being taken ill shortly after leaving London; hoping to return to her family in North America. She was buried in the church here, however that was destroyed by fire in 1727. The church was rebuilt but the exact site of her burial became lost and now she is marked by a statue placed in the middle of the (mostly ‘cleared’) graveyard. I returned to the waterfront and the Town Pier ready for the next stage of the day’s adventure. From here a foot ferry takes passengers and bicycles for a short ride across the Thames over to Tilbury. So it was that I dragged the bike onto the boat and left Kent behind me, bound for Essex. The Tilbury end of the ferry shows how things have changed here in recent years. The docks are still busy as freight container ships load and unload here; but in previous times the foot ferry was part of a complex of travel that also included the old Tilbury Riverside railway station. Next door to that is the Art Deco Cruise Terminal Building. As well as being the start and end points of many cruise holidays (which it still is to this day) new lives were often forged here; many Brits left to emigrate to Australia from here and it was also the landing port for boats such as the Empire Windrush, bringing with it the first group of West Indian immigrants. After a good look around, and still with some miles to tick off, I got back into the saddle and promptly got lost around the estates of Tilbury. If you’re reading this from that town, or have some affection for it, then I’m sorry; but it’s an absolute hole and I found myself pedalling as quickly as I could to try and find my way out of the estates without incident. Put it this way, there was no way that I felt safe to get a map out of my pocket; I made sure I rode quickly, trying to give off the air of someone local who was totally au fait with my direction of travel. Eventually I found myself on the edge of Tilbury and, breathing a sigh of relief, afforded myself a quick stop and a surreptitious glance at my map to check where I had come out of town and where to head next. From Tilbury I carried on through Grays and into Thurrock. There really isn’t much to say of this part of my ride. It was all pretty ghastly. These two towns are a slight improvement on Tilbury, but that’s all relative. I managed to take a couple of wrong turns but eventually found myself close to the northern side of the M25 Dartford Crossing*. Now I just had to find the special bike hut. *Hey pedantic fact fans; its not the M25. Did you know that the M25 is not a complete circuit? The Dartford crossing is actually the A282! It took me a few goes checking various locations. I was hunting for ‘Essex Point’, aka 859 London Road. I had thought that this might be an office for the bridge and tunnel operations but eventually realised that I would most likely have to follow the little cycle path I had spotted heading up onto the motorway sliproad. I was a bit wary but everything turned out fine. When the QEII Bridge was opened in 1991, unlike many other bridges such as the Humber or the original Severn Bridge, there was no provision made for pedestrians or cyclists (for more on the Severn Bridge, stay tuned for a future blog post). Instead the operators run a free shuttle service to ferry cyclists across the river. You just have to turn up at either end, and use the provided telephone to request passage. Having now found the correct point next to the motorway on the Essex side I rang through my request and waited. After 5-10 minutes a van pulled up and the driver hopped out and loaded my bike into the back. We were just about to set off when another cyclist pulled up. The driver and he cheerily said hello. This gentleman uses the service daily to commute between his work in Essex and his home in Kent. The driver told me that there are quite a large number of people who do the same. He had actually assumed that my call for service was actually being made by the other gentleman. Within minutes we were over the bridge and across to the other side at ‘Kent Point’ We unloaded, I gathered my stuff and checked my map, and then headed on for the final few miles. I was onto NCN Route 1 now and managed to fill in a few more miles of that route I had not previously ridden. I’ve now done most of the route through Kent, with the exception of a couple of miles between Rochester and Rainham and between Ebbsfleet and Gravesend. From here I crossed back over the motorway, taking a look back over the bridge and the entrance to the (north bound) tunnels and then made my way to meet the old Roman road, Watling Street. From here a straight few miles riding was pointing me back in the direction of Gravesend, although I wasn’t heading quite that far. Unfortunately I only had the one pannier with me and it was fairly full. I’d therefore have to pass up the offer of a cheap kitten from a farm by the side of the road. Finally the turning I was looking for was ahead of me and I bore North around the large, empty car parks and up to the white elephant station at Ebbsfleet International from where I had planned to get a train back home. I rolled into the station forecourt and cheerily dismounted for the final time. Despite having had what felt like a long day in the saddle, I was still here too early to board a train straight away; bikes are prohibited on the outbound trains during the evening rush hour. So it was that I had just under an hour to explore the many delights of the station. By which I mean I made a coffee and a slice of Millionaires Shortbread from Marks and Spencer last for 45 minutes. An odd way to finish a day’s ride, but there you go!